Just last week, we reported some bad news that Kia is killing off the manual transmission in its little Rio sedan and Rio5 hatchback, two great driving compact cars that deliver more driving fun than their affordable price communicates. Well, some of that might be made up for now that Kia just debuted the 2020 Kia Forte GT. The larger sedan is getting a truly sporty trim option that whets our appetite for fun. 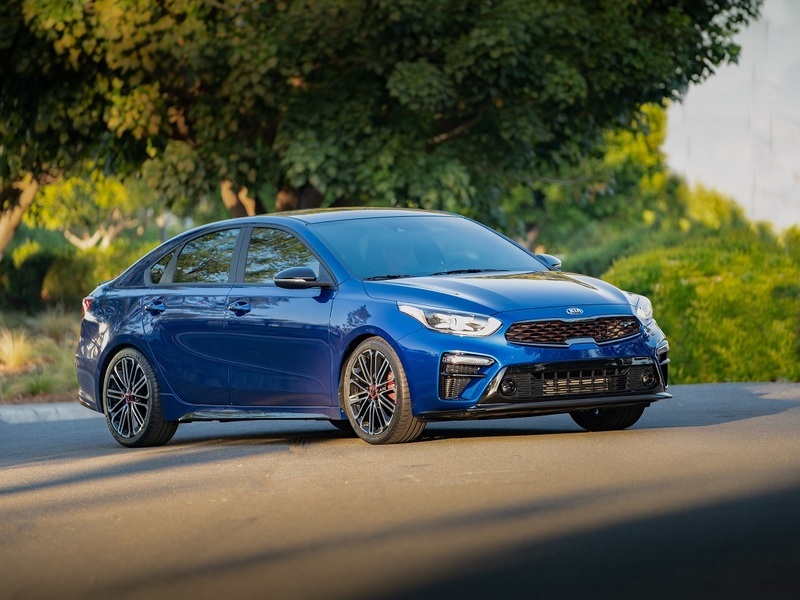 Kia has been trying to draw a stronger connection between the Forte sedan and its new Stinger GT sports sedan. Now, that's evident in the little GT. The Kia Forte GT might not be rear-wheel drive like the Stinger, but it does have the makings for more excitement than most small sedans thanks to a turbocharged four-cylinder engine with 201 horsepower, an available 6-speed manual transmission, styling cues that set it apart from stock, and sport-tuned suspension changes. We can totally get behind this recipe, especially since the regular Forte is pretty great to drive. Under the Forte GT's hood is a turbocharged 1.6-liter four-cylinder mill that spits out a not unsubstantial 201 horsepower from the Forte 5 SX hatchback. Buyers will be able to choose between a six-speed manual transmission or a seven-speed dual-clutch automatic transmission. The DCT comes with paddle shifters and a racy flat-bottom steering wheel. We'd easily go for the manual for optimal fun. This little thing is easily our favorite part of the Kia Forte GT. Under the skin are performance upgrades including a fully independent rear suspension, likely the multilink setup as the Hyundai Elantra Sport. The GT also benefits from 18-inch wheels that can be outfitted with optional Michelin Sport tires that should provide the kind of grip that can exploit the GT's power and chassis. Though the interior isn't substantially more special than the base car's, it is better. The Forte GT gets that handsome flat-bottom steering wheel, LED ambient interior lighting, a sunroof, and most importantly for spirited drivers, optional sports seats with contrast red trim and red 'GT' embossed logos set into the seatbacks. The GT also gets aluminum sport pedals with rubber pads for grip. Cushioning and bolstering should easily be better than stock. On the outside, Kia is adding visual tweaks to the already handsome body. There's a distinct and more aggressive body kit, a rear lip spoiler, a black grille with red highlights, and two-tone wheels, as well as special GT badging that set it apart from the regular Forte sedan. The Kia Forte GT offers a higher level of driving enjoyment and refinement than we'd expect from an affordable automobile. The bad news is that this special version won't go on sale until next year as a 2020 model. The really good news is that the GT trim should show up on the great Forte5 hatchback, as well as the sedan. Perhaps the best news of all is the price, which should be somewhere in the $22,000-to-$23,000 range, a tremendous value for a car that should provide real driving enjoyment for those who can't afford to drop $35K for a performance-minded automobile.